LG G4 takes the manufacturer's smartphone game up a notch. In addition to being the hardware powerhouse we've come to expect from an LG flagship smartphone, the gently curved device adds a touch of bona fide luxury to its arsenal via optional genuine leather back covers. With LG G4, the Korean giant has focused on three key aspects - design, display, and camera, and the last two could as well be the best available on a smartphone at the moment. The 5.5" Quantum IPS has pro-grade color accuracy, while the 16MP f/1.8 camera offers an array of manual controls to take photography to the next level. In a bid to stay away from the controversial Snapdragon 810 chipset, LG has instead chosen to use the Snapdragon 808. This chipset was announced along with the Snapdragon 810 as its more affordable alternative. Instead of a total of 8 cores, it comes with only 6. The choice of chipset, the only slight curvature and the lack of a self-healing will certainly put under strain the sibling relations as in some respects the recently released LG G Flex2 is even better equipped than the flagship. At a quick glance, the LG G4 shapes up to be a dream come true for Android power users. Its removable battery and memory card slot are a rare sight in a flagship smartphone these days - most major players in the field have skipped one of the two, or both features altogether. Developed in-house by LG, the 16MP main camera and the 5.5" QHD Quantum IPS display of the G4 are poised to take on the heavyweights in the segment. Android 5.1 Lollipop out of the box on the other hand, is pleasant surprise - the build is reserved mostly for Nexus hardware for the time being. Most importantly, LG has spent a great deal of time boosting the luxury appeal of its flagship smartphone. The leather backs feel as great as they look, so it will certainly draw the interest of a whole new crowd of potential customers. Qualcomm Snapdragon 808 is the biggest question mark in the LG G4 - it's not clear whether the six-core chipset delivers the right tradeoff between performance and heating and early benchmarks show it certainly doesn't deliver top-tier flagship performance. Following next is an unboxing of the LG G4, followed later by a closer look at its design and build quality. LG G4 ships in a rather understated retail box, which hints at the device's slightly curved design. Inside it, we found a charger and a USB cable. It is worth noting that the unit we tested out for this preview is meant for the South Korean market. We are almost certain that the retail box in certain markets will feature a stereo headset and/or protective case. 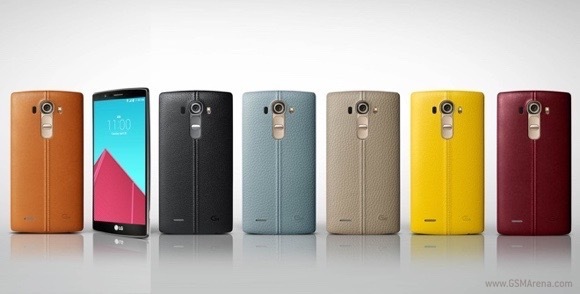 In term of design, LG G4 continues to evolve the looks of its predecessors - LG G2 and LG G3. This time around however, the newcomer has also borrowed cues from the LG G Flex and G Flex 2 - it is slightly curved in a bid to deliver distinctive looks and improved ergonomics. When it comes to looks, the slightly curved body of LG G4 tells only half the story. It is the device's various back covers and their materials and textures, which truly set it apart from its predecessors and the competition. The genuine leather which adorns the optional back covers for the LG G4 is commonly used in the luxury industry, and looks great in person. Available in several different colors and finishes, the hide is stitched with high-end Guttermann's threads and takes a whopping twelve weeks to produce. The plastic covers of the handset has gotten special treatment too. They are have "hammered pattern" with three available finishes - ceramic white, titanium gray, and gold. The white option looks particularly stunning in person, as it has been treated with actual ceramic paint. Build quality of the smartphone is top notch. LG G4 feels solidly put together and ready to match the needs of an Android power user. 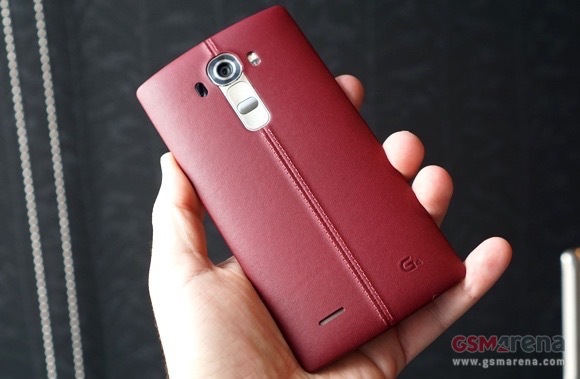 Allegedly, the gently curved body of the LG G4 will allow it to handle casual drops better than competing devices. Just like last year's model, the LG G4 has an amazingly small footprint for a 5.5" smartphone - it measures 148.9 x 76.1 x 9.8 mm, while its weight tips the scale at 155 grams. For comparison, an iPhone 6 Plus with the same size display measures 158.1 x 77.8 x 7.1 mm, and weighs 172 grams. Thanks to its relatively compact and also curved body, it is easy to handle the LG G4. The smartphone feels pleasant in hand, especially in leather guise. Removing the battery cover reveals the user-replaceable 3,000mAh battery and a microSD card slot. Both features should be a boon for power users. One of the biggest highlights in LG G4, its 5.5" QHD Quantum IPS display could well be the best unit available on a smartphone at the moment. The screen boasts pro-grade color accuracy and improved contrast over the QHD unit found in LG G3. LG is keen to point out the screen is superior to the LCD unit found on the iPhone 6 Plus, but we will reserve our final verdict for the full review, after we test the device in our lab. LG G4 boots Android 5.1 Lollipop. As is the case with all LG flagship smartphones, Google's OS is dressed in the Korean giant's latest UX 4.0 interface. See it in action below. A quick look at the UI of the smartphone reveals that it is an evolution of the one found in LG G3. Users of the latter will instantly find themselves in a familiar territory once they power up the LG G4. Of course, users can customize an overwhelming amount of UI elements in the LG G4. Everything ranging from lock screen and home screen transition effects is subject to change if desired. LG's Smart Bulletin can be offers relevant information for the user's daily routine. The feature can be customized or completely disabled. LG have kept a close eye on the new Material Design, which was introduced by Google with Android 5.0 Lollipop. The stock apps of the smartphone have all received the design language treatment, including the _phone_ dialer, the messaging client, and the calendar among others. In a manner befitting a large-screen smartphone, LG G4 supports split-screen multitasking. The feature is easily accessible via the recent apps button - a selector lets you choose the apps you want to run side by side. Overall, LG has focused on polishing the user experience with its latest UX 4.0. There are plenty of features available at the user's disposal, yet their layout and delivery is not overwhelming as it has been with past LG efforts. 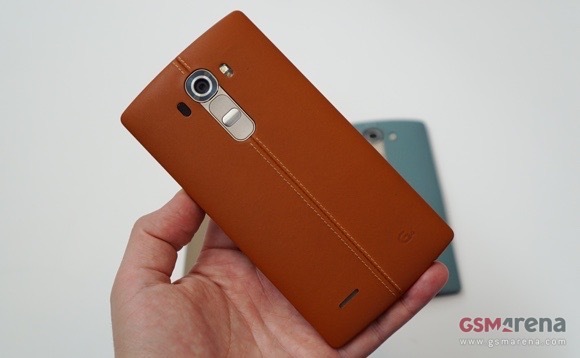 It is up to the LG G4 owners to pick and choose the features they want to utilize. 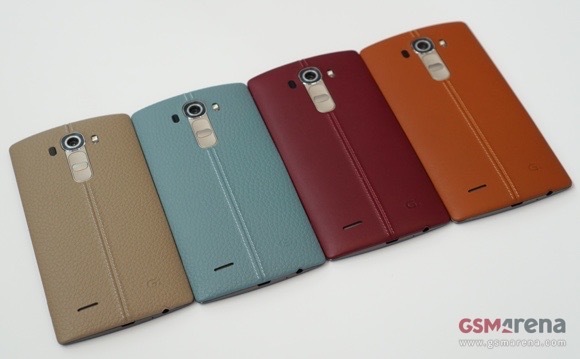 LG G4 is the first smartphone to come out with the Snapdragon 808 chip. Qualcomm announced the 808 revision side by side with the flagship 810 model, but it is only now that we are seeing it in action for the first time. We ran some benchmarks on a Korean preview unit. The smartphone runs Android 5.1 Lollipop and we'd reckon the software should be pretty much final since the _phone_ is already on sale in its motherland. The trend continues in the AnTuTu 5 benchmark, which includes RAM and storage speed into the mix and is an indication of the overall performance of the device. LG G4 came close to HTC One M9, though it is far from the showing of Samsung Galaxy S6. BaseMark OS II is an overall compound benchmark, while BaseMark X focuses on the device's GPU. See the LG G4 results below. GFXBench puts the Adreno 418 GPU of LG G4 to the test. Again, the component doesn't quite match the performance of its competitors in the segment. LG G4 left something to de desired in the web-based benchmarks as well. Overall, LG G4 didn't impress in our benchmark performance tests. We will revisit them when we get our hands on a retail unit of the device, but the early signs don't look promising. It is important to note, that we didn't experience any hiccups while using the smartphone in real life - LG G4 felt snappy and ultra-responsive regardless of the task we threw at it. High-end gaming wasn't an issue either - LG G4 ran Dead Trigger 2 and Real Racing 3 without breaking a sweat. 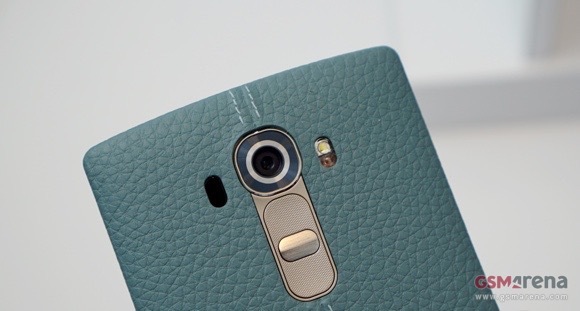 LG G4 comes with a brand new camera. It has a 16MP 1/2.6" sensor, sitting behind an f/1.8 lens that lets in 80% more light compared to the on found in the LG G3 camera. The lens features 3-axis optical stabilization, compared to the 2-axis OIS on the LG G3. LG G4 captures still images with impressive quality - one of the best we've encountered to date. There are amazing levels of resolved detail in each shot, coupled with low noise, and stellar colors and contrast. You can also download a RAW file straight out of the LG G4 camera but you would need a compatible viewer/editor to play with processing it to your taste. Pixel level processing is not as mature as would have liked, but it is forgivable. Only pixel peepers will find anything to pick on here. The smartphone can capture videos in 4K and 1080p. On both instances, the content comes out with impressive quality. See for yourself below. You can also download an unedited 2160p video sample, straight out of the LG G4 camera (00:15min, 55MB). You can also download an unedited 1080p video sample, straight out of the LG G4 camera (00:05min, 12.6MB). A quick glance at LG G4 will quickly suggest that the Korean giants latest flagship smartphone is an evolution of its predecessor and rightfully so. However, improvement in key areas such as build quality and finish, display, and camera take the smartphone to a level, which last years model couldnt reach. LG have been clever to differentiate their creation further in todays market by keeping the removable battery and the memory card slot. Few high-end smartphones offer the aforementioned two features at this moment, thus making the G4 an attractive option for power users. Genuine leather back covers might not seem like a big deal on paper, but they really transform the image of the smartphone. That small piece of vegetable-tanned leather really gives the smartphone a luxurious aura, which we havent seen in any of its predecessors. The camera is superb not only on paper, but in real life too - after spending time with it, we are quite excited to put it against the heavy hitters in the segment in our test lab. The extensive manual controls on the other hand, will appeal to those who take their smartphone photography seriously. The new 5.5 QHD Quantum IPS display offers a solid leap in contrast and overall quality compared to last years LG G3 solution. It could well be the most competent display available on a smartphone at the moment. LG UX 4.0 cuts a fine blend between individualism and generic Material Design. We like that users have full control over its extensive feature set. Android 5.1 Lollipop is a great sight out of the box, especially considering that there are Nexus devices who are still waiting for the build. Qualcomm Snapdragon 808 is undeniably question mark for the LG G4, especially if the initial benchmarks are to be believed. We doubt that LG is to blame on this instance though - Qualcomm appears to have taken a year off instead. To be fair, we didnt experience any performance hiccups during our time with the device. All tasks and games ran as smoothly as they should on a 2015 flagship smartphone. Our full review and final verdict of the smartphone are already under way. This far into our time with the device, we reckon that it rightfully deserves to surpass the sales numbers of its predecessor. All it needs is a proper marketing budget from LG.